I’m kind of weird with mint. I think I associate it too closely with toothpaste so I’m super picky about when I use it. I really, really don’t like it anywhere near my ice cream, chocolate or potatoes. 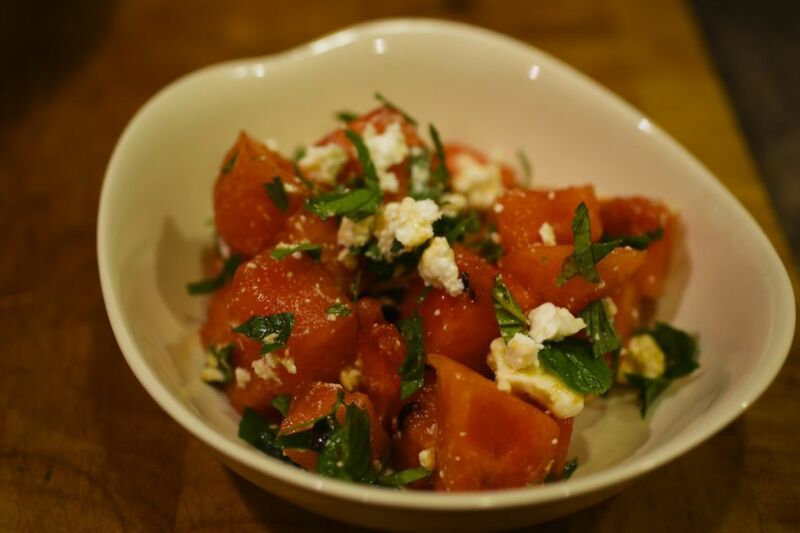 It’s perfect with watermelon and feta though. I decided to make a glaze with honey and balsamic vinegar to brighten the sweet and tart flavors. I left the shallots out this time (because I was tired and forgot them). It was still good but a touch of sharp shallot helps bring it over to the savory side. This is so summery and incredibly quick to make. I must be on a sweet/salty kick because when I bought this watermelon, I couldn’t wait to chop it up and throw some feta and mint on that bad boy (Sorry, not sure why I’m talking like Guy Fieri all of a sudden. Shudder.). This is a classic combination which just really works in a “greater than the sum of it’s parts” sort of way. Don’t forget to buy a seedless watermelon. I got a seeded one by accident and it made it slightly annoying to eat. While I do enjoy spitting watermelon seeds like a trucker spitting dip, it’s less hilarious when it’s in my living room and I’ve got to clean it up. In a small jar, combine the honey, balsamic vinegar, olive oil and a pinch of salt and pepper. Mix well. Cut the watermelon into 3/4 inch cubes and place in a large salad bowl. Add the shallots, chopped mint and crumble the feta over. 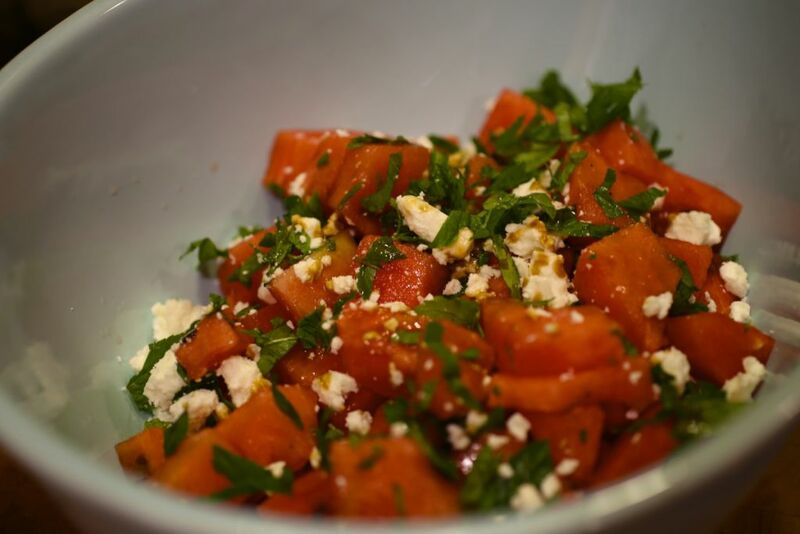 Drizzle a tablespoon or so of the glaze over and mix gently, so you don’t break up the feta too much. Keep it cold until you’re ready to serve. Go easy on the glaze, especially if your watermelon is very sweet. Just a drizzle makes it pop. Don’t like mint? Try basil instead. To make this more of a salad, mix in a big handful of peppery arugula. Hmmm, that is an interesting combination. I am going to give it a try! Definitely try it! It’s surprisingly good. It seems a little weird at first but I think it’s similar to the classic sweet/savory combos like prosciutto wrapped melon or figs stuffed with salty cheese.